For Mauricio it has all been one big long bad day since this adventure began. 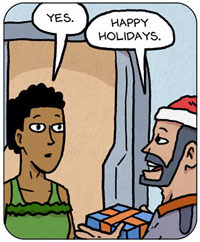 I made a holiday comic, BUT I posted it over on my PATREON page. I am so thankful for Patreon. Freelance comes and goes and has been a little thin this year, and I haven’t had a big book release for a few years (This Spacetrawler story will hopefully be released in the autumn). And Patreon has allowed me to survive and keep working hard to make the best I can for you. YOU have given me this, by supporting me. Thank you. It’s perfectly normal to drink by yourself with Barbot. What a lousy design flaw. Sometimes the customer just wants the shots lined up next to the bottle and leave him (or her) the hell alone for the next hour. How can any competently-assembled barbot lack this recognition? I have to presume the manufacturer makes a good deal out of the one-month warranty they give you, knowing that the repairs for the rest of the year to eighteen months the model survives will comfortably result in the purchaser spending two or three times the purchase price to get the same damn’ dumb barbot who doesn’t know when to leave the bottle and get lost. Nice racket, that. 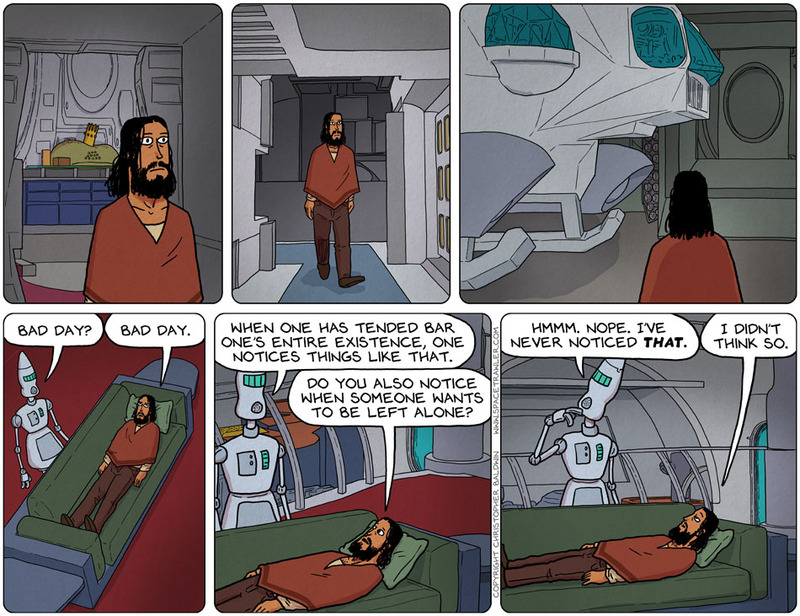 I’m too lazy to look it up in the first Spacetrawler: Didn’t Barbot start out as a counselor/psychoanalyst bot? Ah! Yes! Thank you! IIRC now, therapy bot took over bar-tending duties. Still trying to figure out how to make a Pan-Galactic Gargle Blaster. Mauricio has learned the the “I” in “AI” stands for Ignorance. I wonder what will happen if “pflarb” actually turns out to have worked and these main characters suddenly die! You know, like from a fume or a splash or something. @reader, it’s Jabby’s way of sucking his victims (sorry, “recipients of justice”) in. Everyone becomes so used to his “pflarb-ing” that at one point, someone’s going to stick his/her/its hand/pseudopod/tentacle into the stream of pflarb, only to discover that it has become something like the organic yogurt in that classic ’80s sci-fi-horror film “The Stuff”. And now that it’s been activated, everyone who was pflarbed will now begin to be consumed.